Dapper. 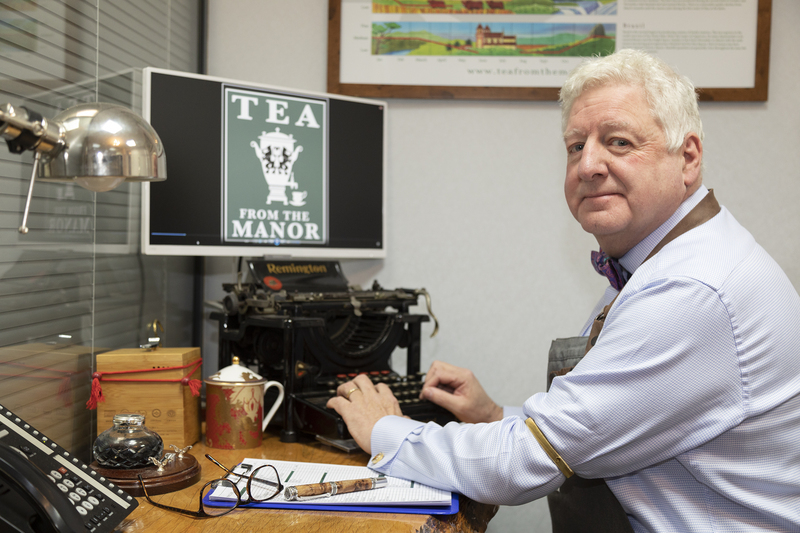 Not a word I often use but, English being an exact language, it’s the only word to describe the proprietor of Tea from The Manor. In his white shirt with gold armbands, bow tie and white curly hair, James Green is the spit of actor Barry Foster of Van der Valk fame, and he is charm itself. I first came across Green when I was doing one of those onerous tasks my Editor often puts me to – reviewing Afternoon Tea at Salford’s Lowry Hotel. The sandwiches and cakes were a great success but the tea, supplied by James, was tea-rrific. Sorry. I wanted to know more so I met him at his office. From the outside it’s a a grey glass and steel new-build in Denton, east Manchester. 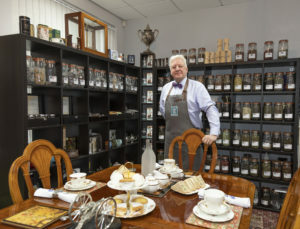 Within there’s a tea-tasting room with dark shelves lined with jars of different teas and souvenirs of his time in the trade, a silver tea service on the mahogany table, all set to go. Next door his assistants are packing tea into boxes to be sent all over the country. That was eight years ago and now Tea from The Manor supplies hotels and restaurants, residential homes, shops and the public, and you can order its tea and associated paraphernalia from the website. It gives you hope, doesn’t it? Considering the huge variety of appearance and taste in Green’s teas, I’m amazed when he tells me they all come from the same plant, Camellia sinensis. The look and flavour depend entirely on how the young green leaves and tops are picked and treated, and there are 27 grades of tea, from full leaf and flower to dust. The finest teas are picked by hand and carefully dried in a variety of ways, whereas your builder’s tea is picked and dried by machine and usually ends up in teabags with the dust going in the cheapest blends. Green does teabags, too, but they’re not your usual flat papery things. They are exquisite pyramids on a fine thread and, whereas most commercial teabags contain a small amount of non-biodegradable plastic, Green’s bags are completely biodegradable. 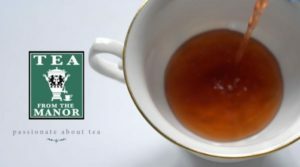 Tea from the Manor supplies the usual teas – English Breakfast, Assam, Lapsang Souchong and others – but they’re all full leaf and flower teas chosen by Green. The Earl Grey Full Leaf is one of the most beautiful teas I have ever tasted. And lots of them have stories. Gunpowder tea is rolled into little balls and unfurls in the pot. This practice dates back to the 7th century as it made it less likely to be damaged when carried on horse or camel-back. It gets its name because the little grey balls resembled the gunpowder of the time. They also have herbal teas including a delicious camomile, and some they blend themselves. When we meet, Green is excited by a Christmas blend they’re working on and he shows me three versions, or rather I smell them. Christmas, without question, is what my nostrils are telling me, and you don’t have to drink them hot. Green’s blend of passion fruit, mango and guava and his red berry blend make excellent iced teas. You can also make granitas out of almost any tea, but the smoked ones work best. With microbrewery beer and artisanal coffee all over the place, there must be room for a fine tea emporium somewhere in Manchester. And while I think about it, the Campaign for Real Ale (CAMRA) was successful in changing the British view of beer (I’m old enough to remember Double Diamond and Watney’s Red Barrel, and you don’t see those any more, thank Dionysus). So, maybe it’s time for CAMFORT, the Campaign for Real Tea? I know just the man for it.